This article is about the person. For the brand of popcorn, see Orville Redenbacher's. The New York Times described him as "the agricultural visionary who all but single-handedly revolutionized the American popcorn industry." Redenbacher was born in Brazil, Indiana, on July 16, 1907, to William Joseph Redenbacher (1872–1939), a farmer, and Julia Magdalena Dierdorff (1874–1944). He grew up on his family's farm where he sometimes sold popcorn from the back of his car. He graduated from Brazil High School in 1924 in the top 5% of his class. He attended Purdue University, where he joined the agriculture-oriented Alpha Gamma Rho fraternity, marched tuba in the Purdue All-American Marching Band, joined the Purdue University track team, and worked at The Purdue Exponent. He graduated in 1928 with a degree in agronomy. He spent most of his life in the agriculture industry, serving as a Vigo County Farm Bureau extension agent in Terre Haute, Indiana, and at Princeton Farms in Princeton, Indiana. In 1951, he and partner Charlie Bowman bought the George F. Chester and Son seed corn plant in Boone Grove, Indiana. Naming the company "Chester Hybrids", they tried tens of thousands of hybrid strains of popcorn before settling on a hybrid they named "RedBow". In 1976, Redenbacher sold the company to Hunt-Wesson Foods, a division of Norton Simon, Inc. In 1983, Esmark purchased Norton Simon, and in 1984 Beatrice Foods acquired Esmark. In 1985, Kohlberg Kravis Roberts acquired Beatrice with the goal of selling off businesses. In 1990, they sold the popcorn business and other old Hunt-Wesson businesses to agribusiness giant ConAgra. In 1973 Redenbacher appeared on TV's To Tell the Truth game show. By the mid 1970s, Redenbacher and Bowman had captured a third of the unpopped-popcorn market. Redenbacher then moved to Coronado, California. He appeared as the company's official spokesman, wearing a trademark outfit in public that included horn-rimmed glasses and a bow tie. Sometimes Redenbacher appeared in commercials with his grandson. Some customers wrote letters asking if Redenbacher was a real person, and not an actor (see, e.g., Bartles & Jaymes). He responded to this by appearing on various talk shows, professing his identity. Redenbacher, in his book, states, "I want to make it clear that I am real." Redenbacher was married to his first wife, Corinne Rosemund Strate (1909–1971), from 1928 until her death on May 24, 1971. He remarried later that year to his second wife, Nina Reder, who died on May 8, 1991, at the age of 91. The NYTimes noted that "Redenbacher is survived by two daughters, Billie Ann Atwood of San Jose, Calif., and Gail Tuminello of Valparaiso, Ind. ; 12 grandchildren and 10 great-grandchildren." On September 19, 1995, Redenbacher was found dead in the Jacuzzi of his condominium in Coronado, California. He had suffered a heart attack and drowned. He was cremated and his ashes scattered at sea. In 1988, Purdue University awarded him an honorary doctorate. Aside from his popcorn contribution, the entertainment provided by the TV commercials in which he starred were noteworthy. Since 2006, several of Orville's commercials from the 1970s and 1980s have aired on many channels across the United States. The advertisements for the brand's "natural" popcorn snacks were introduced in 2008, 13 years after Redenbacher's death, and feature a clip of him at the end. ^ a b "Orville Clarence Redenbacher". ^ a b c Robert Thomas, Jr. (September 20, 1995). "Orville Redenbacher, Famous For His Popcorn, Is Dead at 88". The New York Times. ^ "About Purdue Bands and Orchestras". ^ "From the Archives revealed: Orville Redenbacher". Purdue.edu. ^ a b Thomas, Robert (September 21, 1995). "Orville Redenbacher, Famous For His Popcorn, Is Dead at 88". The New York Times. p. D20. ^ a b c d Wieland, Phil. "Orville Redenbacher: A passion for popcorn". The Times of Northwest Indiana. Retrieved 31 October 2014. ^ Gail Collins (December 31, 1995). "The Lives They Lived: Orville Redenbacher;Our Inner Nerd". The New York Times. Retrieved October 12, 2013. ^ a b "Popcorn king Orville Redenbacher makes Coronado home". December 14, 1978. Redenbacher, who lives with his wife in a Coronado Shores ... sold it to the California-based Hunt-Wesson Foods Inc.
^ "Orville Redenbacher and his popcorn weren't always well-known". TV Squad. July 2, 2009. ^ "Orville Redenbacher, King of Popcorn". 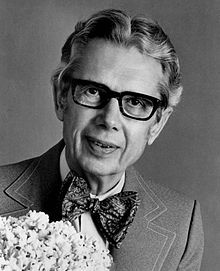 Orville Redenbacher, with his bow tie, wavy hair, toothy grin, and thick glasses, was a TV popcorn commercial celebrity and a real farmer. ^ Bruce Horovitz (January 12, 2007). "ConAgra revives Redenbacher for popcorn ads". USA Today. Retrieved October 12, 2013. ^ "Statue honors popcorn king Redenbacher". Terre Haute Tribute Star. Associated Press. September 5, 2012. This page was last edited on 23 April 2019, at 17:50 (UTC).